The schizo weather here in CO continues, with lashings of snow followed by several days in the high 70's, and with torrential rain, tornadoes and hail moving through this evening. Pretty much par for the course for springtime in the Rockies! 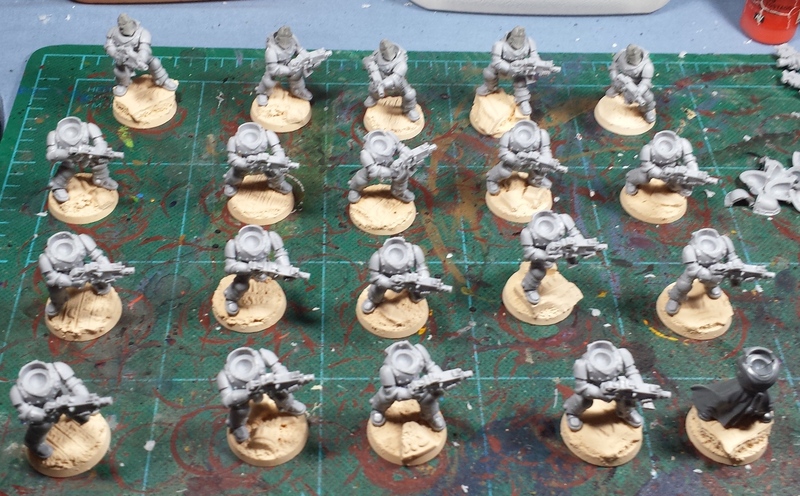 In the meantime I've started the build of the twenty-man tactical squad for the heresy era Thousand Sons - though the Prospero book has been postponed until sometime in 2015 (or beyond), every heresy army needs at least one big ol' blob squad of bog standard marines! 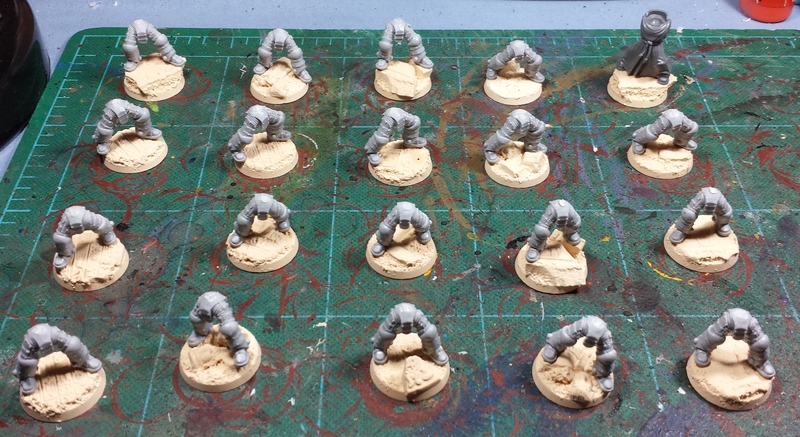 First things first, sorting out which legs fit on which bases. This step ended up taking a surprisingly long time. The MkII legs have a very wide stance, and the bases I'm using didn't want to cooperate particularly well it seemed. Got there in the end, though! Once the legs are on, time for torsos and arms. In general when I glue on torsos I'll take it in turn to glue one on twisted to the left, one twisted to the right, and one straight forward, then repeating the pattern. This helps give the models a little dynamism, instead of all just pointing in the same basic direction. Once the torsos dry it's time to add the arms and bolters - I'll generally glue the right arm on first, followed by the left arm which is glued in place with the palm of the hand just slightly lower than the level of the top of the right hand's fist - this means that when the bolter is glued in place, it fits juuuust right. About 80% of the time, that even works as intended and I don't have to pry the right arm loose and reposition it. Heh. Placement of the head in relation to the body is incredibly important at this point, and is what really sets how natural/dynamic the models will end up looking. A good rule of thumb is to have the face pointing either in the direction of the weapon's muzzle, or in line with one of the feet if the muzzle is pointing in a direction outside the arc described by both of the models feet. 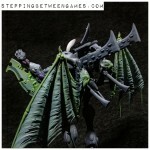 The above shot illustrates the idea - the 1st, 3rd, and 5th model's weapons are within the arc of the feet and so the head faces the direction of the muzzle. On the 2nd and 4th, the muzzle of the weapon is outside that arc, and having the head pointing in the muzzle direction would make the model seem as though it's twisting around in an awkward pose. 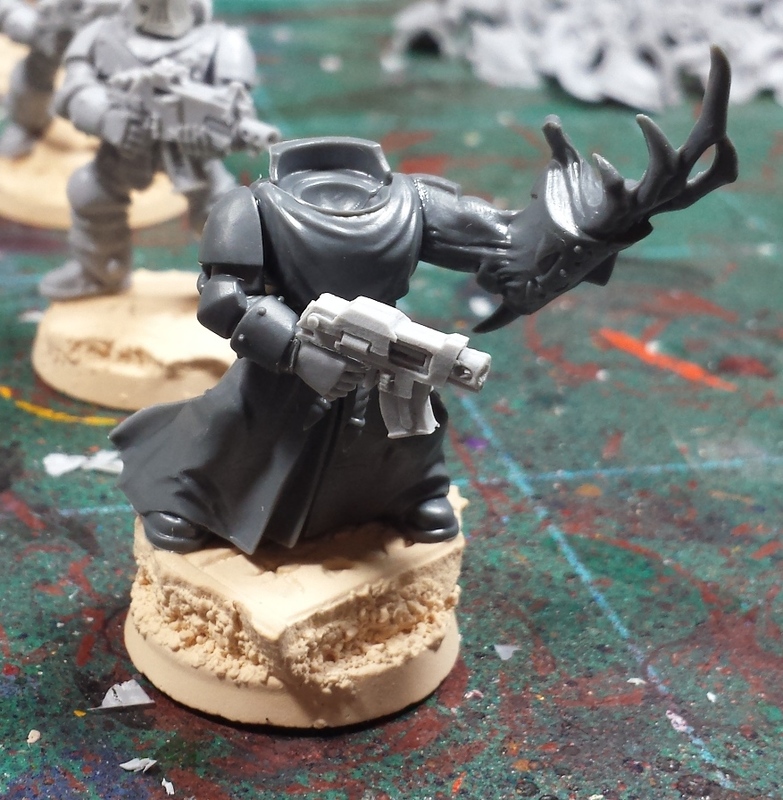 Having the head pointing in line with one of the feet gives the impression that the model is advancing with the bolter held across its chest. Here's the whole unit with heads. Overall they feel very natural, though relatively reserved, which I think is suitable for the tactical marines - they definitely give off a different vibe from the more bombastically posed assault marines. You may notice on the 2nd row from the front, on the far right I broke my posing rule and the bolter's muzzle and the head's eyeline are both outside the arc described by the model's feet, which means he ended up looking a little awkward. Ah well, he'll consistently be the first casualty when the unit starts taking fire! I wanted to make an homage to the previous version of sergeant Hesyre, though I'm still awaiting bits to finish him off. The poor sergeant is suffering from a touch of the fleshchange, it appears! 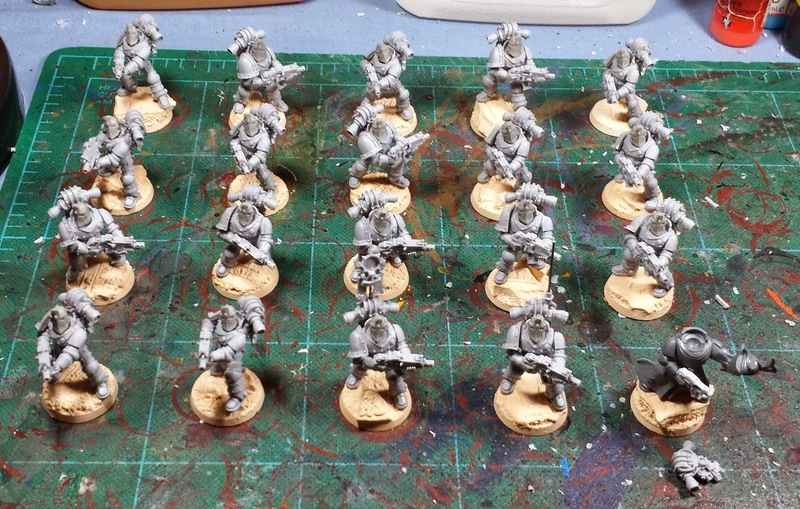 Lastly, the right shoulder pads and backpacks are attached and the squad is more or less ready for primer. ...Assuming it doesn't snow tomorrow, that is! I agree totally with the head thing! Get it wrong and they just look... Off. By the way, what bases are you using on them?